Iain Duncan Smith loves families. Nice families, of course, with a mum and a dad – not any old rag-tag childrearing unit. His Centre For Social Justice believes that “married two-parent families produce the best outcomes for both adults and children”, and in government, he’s contributed to the policy of removing the dubious “couples penalty” from the benefits system. Why dubious? 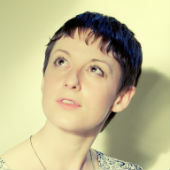 “They calculate this penalty,” says Lisa Ansell, “by looking at net state support, but with no consideration for the cost of childcare or rent, or the earnings potential of a single person with responsibility for a child.” In other words, the intention is to strip out the benefits that help the most vulnerable parents and children to survive, because the government believes it would be altogether better if those single mums would just settle down with a nice man – and the state is not going to pay anyone to stay single, dammit. 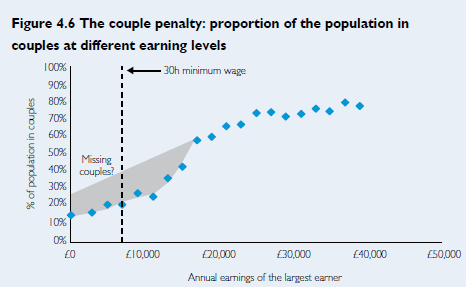 ﻿﻿﻿﻿﻿﻿﻿﻿ Incidentally, the CSJ doesn’t seem to have looked into the idea that those “missing couples” on its little graph as the wages of the highest earner dip below £20k could reflect the possibility that poverty is both a cause and an effect of lone parenthood – in which case, making people more poor isn’t very likely to make them less lone. But still, at least Iain Duncan Smith has a plan to get the unemployed into work. The plan: move people to where the work is. “We have to look at how we get that portability, so that people can be more flexible, can look for work, can take the risk to do it,” says IDS. What risks? Well, for one thing, moving away from an extended social network is a risk factor for divorce – couples are more likely to survive if they belong to a shared group of friends and family with an investment in their futures. Families aren’t just the product of two adults slogging it out together. It takes intricate support systems to bring up children – more so if you’re working, and need a bit of help smoothing off the difficult edges around childcare. Dragging people away from the relationships they have, distancing them from grandparents – these things are more of an attack on the family than supporting single parents could ever be. It turns out that, however much IDS loves families, he loves putting people at the service of corporate interests even more. Duly shared. Thought I was reading CiF for a minute.